Click on logoONE DEGREE MAKES ALL THE DIFFERENCE. Manalapan linebacker Justin Dattolo's name was inadvertently left off the All-Freehold Regional District Football Team. Dattolo, a senior, was a two-year starter for the Braves and played middle linebacker. Manalapan again rode a big November to finish 5-5 and avoid its first losing season in years. Jimmy Gilburn ran for more than 1,000 yards (keeping that Manalapan tradition of 1,000-yard rushers) behind fullback Steve Ching and an offensive line led by Jarrett Levin. Sophomore quarterback Mike Bimonte did better than could be expected, and now the position is in secure hands for the next two years. Mike Seminerio and Chris Essner sparked the Brave defense. 2008 All-Freehold Regional District Football Team. Gilburn capped his career in style with a career-high 279 yards and three touchdowns on 27 carries in a 41-20 win over Marlboro that put Gilburn over the 1,000-yard mark for the season in a year in which he made the transition from tight end/wide receiver as a junior to a running back. The Doc Berman Trophy is staying put in Manalapan for yet another year.The Braves can thank senior running back James Gilburn for that as he ripped off 279 yards on 27 carries and ran for three touchdowns to lead Manalapan to a 41-20 victory over Thanksgiving rival Marlboro on Thursday. The trophy is presented annually to the winner of the Manalapan vs Marlboro Thanksgiving Day Football Game. Manalapan holds a 20 to 5 game advantage over Marlboro. The last time Marlboro held the trophy was in 1994. Justin Dattolo rushed for 105 yards and James Gilburn ran in a 3 yard touchdown as the Manalapan Braves edged the Cougars of Montgomery. A fourth quarter safety by the Braves pushed the score to 8 to 3. In the second to last regular season game of his high school career, Jimmy Gilburn displayed the versatility he has relied on throughout his varsity career. 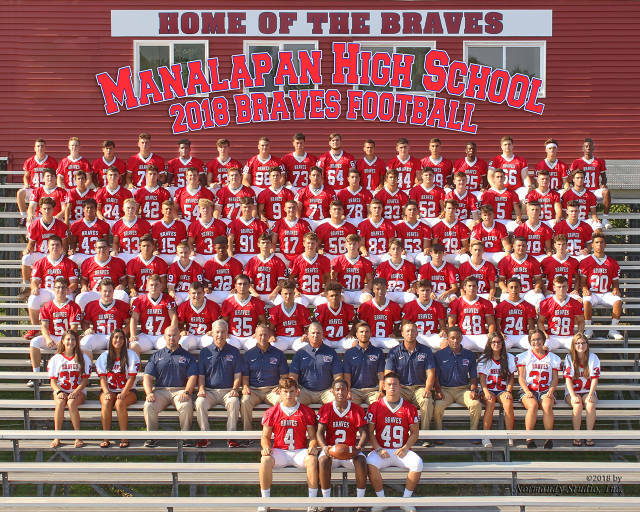 The Manalapan Braves JV squad beat the Allentown Red Birds JV 32 to 7. The day was highlighted by two interceptions by Dan Masterov. Also a pass from Reggie Hodge-Grant to Skylar O'Connor put the Braves up by three scores early in the first half. A blocked punt by Mike Pokazayev on the fourth play of the game set the Braves up with the first score of the contest. Josh Firkser dove into the end zone for a 1-yard touchdown run to put Manalapan on the board with 1:11 left. Bimonte hit sophomore Josh Firkser for a 30-yard touchdown pass with 14 seconds left and Manalapan held on to beat Ocean, 12-7.
click on logo for articleManalapan's Jimmy Gilburn (No. 13) speeds past a block made against Ocean Township's Shaun Goodwin (No. 12) during a game on Oct. 4, won by Manalapan by a score of 12-7.If any team knows that as long as there is time on the clock you can win, it's the Manalapan High School football team. A touchdown pass from Michael Bimonte to Chris Pellicano with 34 seconds left in regulation helped Manalapan avoid an 0-2 hole to star the year. Manalapan's Kevin Cruz fights for the reception with less than a minute left in the game. Pellicano had three catches for 83 yards, and two of his catches were for touchdowns. He caught a 54-yard touchdown pass in the first half and then caught a 22-yard TD pass with just 34 seconds left in the game to help the Braves pull out a 23-21 thriller over Jackson. Cruz's strip and fumble return helped set up the game-winning touchdown in a 23-21 win over Jackson. Manalapan sophomore quarterback Mike Bimonte is going to have his struggles in his first year, but when the game is on the line, as he showed on Friday night, he is more than capable of making a big play. MANALAPAN WINS CONFERENCE GAME. WITH LESS THAN TWO MINUTES LEFT IN THE GAME AND LOSING 21 TO 17. KEVIN CRUZ RECOVERED A FUMBLE AND RETURNED THE BALL TO THE JACKSON 30 YARD LINE. FOUR PLAYS LATER MIKE BIMONTE HIT CHRIS PELLICANO IN THE END ZONE TO REGAIN THE LEAD. Braves looking for early success.The last few years have seen the Braves finish the season strong, but only after digging itself a hole. If that trend is to end, it won't be easy, as the Braves, who have moved up from the Constitution Division to the American, open at home with 2007 NJSIAA Central Jersey Group IV playoff teams Colts Neck and Jackson Memorial, before heading to Toms River North to take on the reigning South Jersey Group IV champion Mariners. In the middle of the first quarter, Gilburn took a handoff around the right side, shed a would-be tackler and went 63 yards for a touchdown. Michael Klepper's 23-yard field goal with 5:53 left in the second quarter increased Manalapan's lead. Manalapan made a successful transition to new head coach Tom Gallahue last fall. The Braves maintained their winning tradition, going 6-4. But it wasn't enough. Bob Badders (Digital Sports) also stopped by Manalapan camp, and here is a few quick nuggets. The Braves' new quarterback will be sophomore Michael Bimonte, who will replace Craig Peterson (Monmouth University). Manalapan also returns arguably the top tight end in the Shore, senior Jimmy Gilburn, who has received I-AA interest at the Northeast Conference level. Also, Manalapan's new starting fullback, Steven Ching, is 5-foot-9 and 290 (!) pounds with good athleticism and decent enough hands to be a threat as a safety valve in the passing game. Imagine opposing coaches yelling at their linebackers about Ching - "Why didn't you shed that block from the fullback and make the tackle?!!'' Uh, coach, he outweighs me by 100 pounds. Finally, here's an interesting stat about the Braves: The last three years they have started either 1-2 or 0-3. However, their combined record in their final seven games over the last three years is 19-2. They've gone 7-0, 6-1 and 6-1 in their final seven games, so it's obvious how much difference a good start could make. As for Manalapan, the Braves lost quarterback Craig Peterson, running back David Presby and top lineman Tom Sozzi, so it's more in replacing the star power. However, this school is the definition of a program. It just keeps churning out wins and playoff appearances, although the Braves came up just short of the postseason last year. I think they will be competitive as always. CRAIG PETERSON,DAVID PRESBY AND TOM SOZZI ARE NAMED TO ALL SHORE GRIDIRON CLASSIC ROSTER. click on logo to see articleNorth Wins the 30th State Farm Insurance North vs South Football Classic 31 to 25. Congratulations to the following Braves each took first place. Congratulations to Justin Dattola who scored third overall against the top competitors in the shore conference. James Gilburn was also listed amongst the top ten best in overall scores.